Earned Value Analysis or Earned Value Management is considered to be one of the more difficult concepts of Project Management. Many practicing professionals find the earned value terms and definitions confounding. They dread the formulas and calculations. I believe, Earned Value Analysis concept is lot simpler than it is made out to be. After reading this article, you too will find it easy. I will explain earned value terms, definitions, formulas, and calculations using a small example. Do you know why most professionals find Earned Value confusing? I believe PMP prep books and training programs should be blamed for the state of confusion. They have just over-complicated an easy concept. They stress more on formulas and calculations without explaining the basic concepts. Let me be honest here. My first experience with Earned Value Analysis was on similar lines. I did not find the concept intuitive during the initial days of my PMP exam prep. Even though my first experience was not pleasant, I persevered. I re-read the concepts and understood with the help of examples. After, I understood the topic, Earned Value Management seemed like a walk in the park. The basic principle of Earned Value (EV) is based on the fact that everyone understands the language of money. In simple words we can say that, Earned Value is the monetary value of the completed work. For example, if I have made 5 widgets and each widget is worth $10 then I can say that my earned value is $50 (5 X $10). In Earned Value Analysis (EVA) everything is measured and reported as money or monetary equivalent. The project team determines an equivalence between Scope, Schedule, Cost to do this. 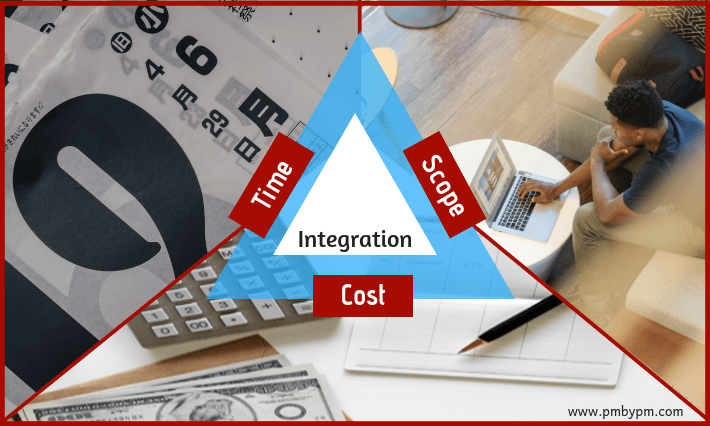 EVA provides a singular view of Scope, Schedule and Cost. Let us understand equivalence by the following example. In this article, I have explained EVA by using a small example. In another post, I have provided its explanation in simple and easy language. You should read both these articles to understand the concept completely. Let us look at the example. Let us consider that we have to complete a small project. We need to build wooden tables. The project team needs to build 80 wooden tables in 5 days. It is estimated that each table will cost 1000 units of money. The following figure provides initial plan for the project. It also provides equivalence between Project Scope, Schedule, and Cost. The following figure provides detailed Schedule and Cost estimates at the start of the project. Let us assume that, the project was started 3 days ago and we are evaluating the performance at the end of Day 3. The following figure provides status at the end of Day 3. There are two new rows that depict the progress of the project. These are shown in light orange background. Is the Project Team making good progress? Some of you might say that project has saved cost. The team has spent 36000 units of money against an estimate of 40000 units. Some others might say that project is behind. The team has build only 36 tables instead of planned 40. Both are incorrect interpretation of the given data. The data, itself, is incomplete. Do you know how much work has been completed? How many tables were built at the end of Day 3? We need another parameter to determine the progress of the project. Let us introduce some more data in the above figure. You would have noticed that only 35 tables were built at the end of the day 3. These are the 3 basic terms/values of EVA. The modern names for these terms are Planned Value (PV), Earned Value (EV) and Actual Cost (AC) respectively. We can interpret a few things by analyzing the above data. 1. The project is behind schedule. The Project Team had planned to build 40 tables at the end of Day 3. They could only build 35 tables. In EVA parlance we can say that Project Team planned to complete the work that was worth 40000 units of money. They completed the work that was worth 35000 units of money. 2. The project is Over Budget. The Project Team build 35 tables at the end of Day 3. In EVA parlance we can say that they completed the work that was worth 35000 units of money. The Project Team spent 36000 units of money to build 35 tables. In EVA parlance we can say that 36000 units of money was spent for doing the work that was worth 35000 units of money. Let us write initial formulas based on above interpretations. You can refer to my other article for a complete list of EVM formulas. EV is the first term in all the formulas. Negative variance means Project is behind. Positive variance means Project is ahead. Efficiency less than 1 means Project is behind. Efficiency of greater than 1 means Project is ahead. Do you still have any confusion about earned value analysis? Can you apply formulas and do earned value calculations at the end of Day 2? This example is really very helpful for all PMP aspirants. And that couldn’t be more accurate right here. Having said that, allow me say to you exactly what did work. Your article (parts of it) is certainly rather powerful which is possibly the reason why I am taking an effort to comment. EV is always the actual earn. If you look at the 3rd table, it clearly says that 35 tables only been built by EOD of 3rd day, which in dollar value is 35000. What was originally planned is 40K, so PV = 40K. Hope, it is clear now. Hi Sanjeev, Only cumulative values are considered i.e total till the end of Day 3. Where is the confusion? Good explanation but small arithmetic error in the results. SV = 35000 – 40000 = -5000 and not -4000 as stated in the article. Thanks Jonathan. I have corrected it.